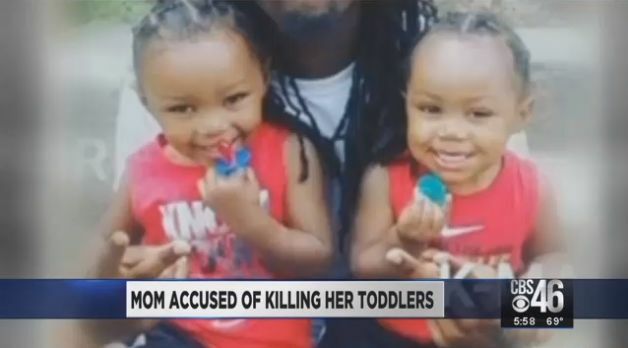 ATLANTA, Ga. — A Georgia mother has been charged with murder after being accused of killing her two toddler boys by shutting them in a hot oven. Lamora Williams, 24, allegedly killed her sons Ja’Karter, 1, Ke-Yaunte, 2, sometime between Thursday and Friday. According to reports, she called the boys’ father, Jameel Penn, following the incident and advised via video chat that there was something wrong. When she panned around the room, he saw two of his children motionless on the floor, and immediately called police. Officers arrived to find the toddlers dead and with burn marks on their bodies. “I ain’t got no soul no more,” Penn said during a vigil for the boys, according to the Atlanta Journal-Constitution. Williams’ friend, Neesa Smith, told the outlet that she received a call before Penn, as Williams advised that she “couldn’t do it anymore.” Williams had reportedly left her job a month ago to take care of the children after she couldn’t find a babysitter. Penn and Williams have four children; one was not at home that night and the other was not harmed. Smith said that when she asked Williams to explain what she meant by “I couldn’t do it anymore,” she was informed that the toddlers were dead. Smith told Williams to call the police, but she called Penn instead. When police arrived on the scene, Williams told them that she had left her sons with a babysitter and returned home to find them dead. Williams’ family says that she has long had mental health issues, and they have been concerned that something bad might happen. She said she attempted to obtain custody of the children to no avail. Williams is being held in the Fulton County Jail without bond, and the stove/oven has been removed from the apartment for further investigation. A funeral is scheduled for Saturday at West Hunter Baptist Church.